ShuttleMate provides Premium Airport transfer solutions around Noosa and on the Sunshine Coast for large families, groups, corporate clients and International students. 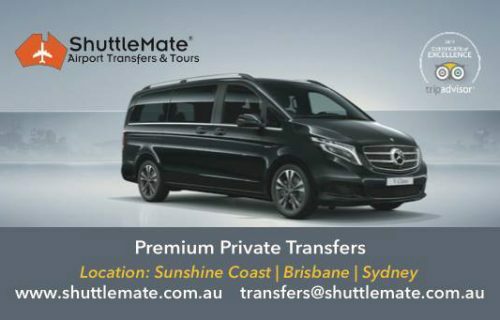 We specialise in Airport Transfers (Sunshine Coast and Brisbane Airports), Cruise Terminal transfers, Day Tours, Weddings, Events and Races, Beach transfers, Restaurant transfers and Charters. Certificate of Excellence 2017 awarded by TripAdvisor for consistently earning great reviews from travellers.